April showers bring AMC series premieres. The network has just released their Spring 2016 premiere schedule and a crop of new photos. Spring will see new seasons from Fear the Walking Dead and Turn: Washington’s Spies, with the premiere of AMC’s new mini-series The Night Manager. The second season Fear the Walking Dead will debut on April 10th, at 9 p.m. The Walking Dead prequel explores the beginning of the zombie apocalypse that haunts its successor. The 15 episodes of season two will be split into two parts, with the first half debuting in the spring and the second half premiering later in 2016. 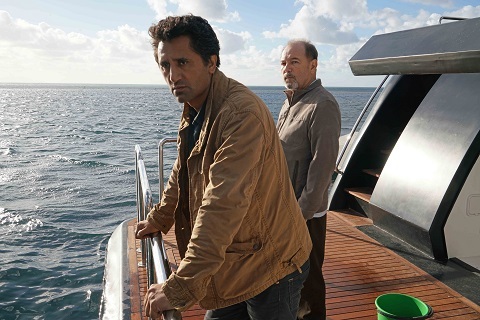 As always, new episodes of Fear the Walking Dead will be followed by Talking Dead at 10 p.m. on Sundays. Next up, the premiere of AMC’s original mini-series The Night Manager is set for April 19th. The six-part series is based off the John le Carré novel of the same name. It stars Tom Hiddleston as a spy tasked to gain information on a mysterious arms dealer played by Hugh Laurie. Season three of Turn will premiere on April 25th, at 10 p.m.
PASADENA, CA – January 8, 2016 – AMC announced today from the Television Critics Association (TCA) Press Tour the network’s 2016 spring premiere dates for new and returning original series. For the first time ever, AMC will launch a fourth night of original programming on Tuesdays beginning this April with the debut of the highly anticipated mini-series event “The Night Manager.” Last year, AMC became home to the top four cable series launches of all time among adults 18-49 in live+3 ratings, with “Fear the Walking Dead” at #1, “Better Call Saul” at #2, “Into the Badlands” at #3 and “The Walking Dead” at #4. “Fear the Walking Dead” will air its second season of 15 episodes in two parts, beginning with the first of seven episodes on Sunday, April 10th at 9:00 p.m. ET/PT. The remaining eight episodes will air later in 2016. The series, which delivered the highest-rated first season of any series in cable history among total viewers and all key demos in live+3 ratings, is executive produced by showrunner Dave Erickson, Robert Kirkman, Gale Anne Hurd, Greg Nicotero and David Alpert and stars Kim Dickens as Madison, Cliff Curtis as Travis, Frank Dillane as Nick, Alycia Debnam-Carey as Alicia, Ruben Blades as Daniel, Mercedes Mason as Ofelia, Lorenzo James Henrie as Chris and Colman Domingo as Strand. The series began production on season two last month in the Baja peninsula in Mexico at Baja Studios, home to some of the greatest ocean-set films in recent years. Season one left off with Madison, Travis and their extended family taking temporary shelter in Strand’s gated estate overlooking the Pacific Ocean. As civil unrest continues to grow and the dead take over Los Angeles, Strand prepares to escape to “Abigail,” his large yacht moored offshore. Beginning Tuesday, January 26th, the complete first season of “Fear the Walking Dead” will be available to stream exclusively on Hulu. Hulu subscribers can catch up on all episodes of the series through Hulu’s No Commercials and Limited Commercials plans ahead of the second season premiere on AMC. The series comes to Hulu in an exclusive, multi-year licensing agreement with AMC Networks Inc. Launching a new night for AMC originals is the six-part mini-series event “The Night Manager,” premiering on Tuesday, April 19th at 10:00 p.m. ET/PT. A contemporary interpretation of John le Carré’s espionage drama, the series follows former British soldier Jonathan Pine (Tom Hiddleston), who is recruited by intelligence operative Angela Burr (Olivia Colman) to infiltrate the inner circle of international businessman Richard Onslow Roper (Hugh Laurie) and detonate the unholy alliance he has ministered between the intelligence community and the secret arms trade. To get to the heart of Roper’s vast empire, Pine must withstand the suspicious interrogations of his venal chief of staff Major Corkoran (Tom Hollander) and the allure of his beautiful girlfriend Jed (Elizabeth Debicki). In his quest to do the right thing, Pine must first become a criminal himself. Executive producers include John Le Carré, Simon Cornwell, Stephen Cornwell and Stephen Garrett. Writer David Farr also serves as an executive producer as does Academy Award(R) winner Susanne Bier, who served as director. “TURN: Washington’s Spies” premieres its third season on Monday, April 25th at 10:00 p.m. ET/PT. The Revolutionary War spy thriller, starring Jamie Bell (Flags of Our Fathers, Snowpiercer) as Abraham Woodhull and executive produced by Craig Silverstein and Barry Josephson, returns with an epic 10-episode season that builds towards one of the most notorious moments in American history – the treasonous defection of Benedict Arnold (Owain Yeoman). Behind enemy lines on Long Island, Abe Woodhull is a spy for the Patriots, reporting directly to George Washington (Ian Kahn). Embedded within the Continental Army, Benedict Arnold is seduced to become an informant for the British. As the consequences of their espionage ripple through the battlefield, the spy game becomes a heart-stopping race to see which mole will be unmasked first. In 1778, there is only one fate that awaits a captured spy – the hangman’s noose. The price for treason is blood, and not all of our heroes will survive. “TURN: Washington’s Spies” is based on the book Washington’s Spies by Alexander Rose. In addition to Bell, Yeoman and Kahn, the series stars Seth Numrich as Benjamin Tallmadge, Daniel Henshall as Caleb Brewster, Heather Lind as Anna Strong, Kevin R. McNally as Judge Richard Woodhull, Meegan Warner as Mary Woodhull, Burn Gorman as Major Hewlett, Angus Macfadyen as Robert Rogers, JJ Feild as Major John André, Samuel Roukin as Captain John Simcoe, Ksenia Solo as Peggy Shippen and Nick Westrate as Robert Townsend. What do you think? Are you a fan of Turn or Fear the Walking Dead? Will you tune in for the premiere of The Night Manager? More about: AMC TV shows: canceled or renewed?, Fear the Walking Dead, Fear the Walking Dead: canceled or renewed?, The Night Manager, The Night Manager: canceled or renewed?, Turn: Washington's Spies, Turn: Washington's Spies: canceled or renewed? Loved FEAR THE WALKING DEAD and TURN. Wish they were starting sooner. Also looking forward to watching THE NIGHT MANAGER!